Day 3 of our Namibian trip was spent visiting 2 hospitals in the North of Namibia. 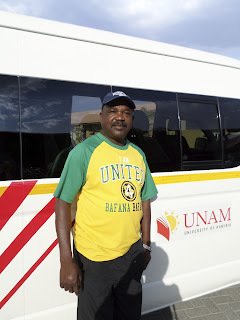 We flew from Windhoek to Ondangwa and spent the day travelling with Prof Celestine Mbangtang and visited 2 of the regional hospitals. Our first stop was Oshakati Intermediate Hospital. The hospital has about 750 bed capacity but may admit up to 800 patients. The main part was built in 1965. It is made up of many individual single storey buildings linked by long walkways. The hospital is gradually being rebuilt. The surgical ward we visited was opened 2 years ago and is very clean and modern. One of the women we met on the ward was admitted for investigation for her breast cancer. 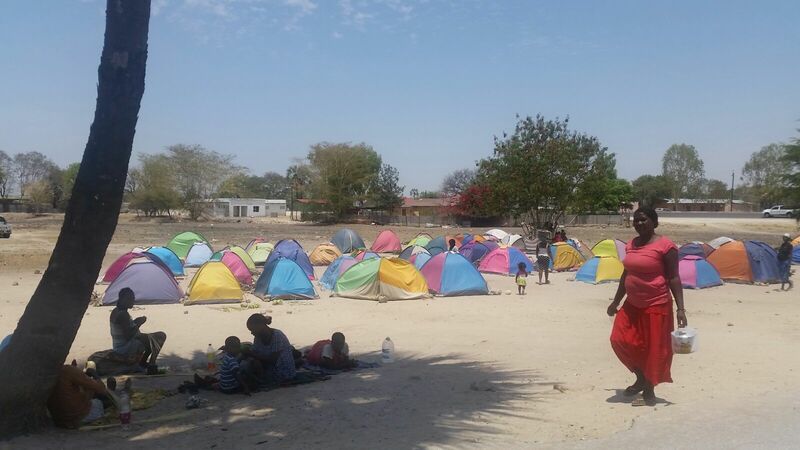 The distances in Namibia are vast which does not permit an efficient out patient service. There is a small oncology unit in the older part of the hospital. Only patients with Karposi's sarcoma are treated with chemotherapy in the unit. Any woman with breast cancer who needs chemotherapy is referred to Windhoek. Surgery can be done at the hospital and the waiting time for surgery is relatively short although there are many emergency operations that compete for theatre time. We then drove to Engela Hospital which is a smaller hospital. There are 250 beds and there are only 6 full time doctors working there. Although they have a theatre complex, they do not have surgeon so cannot do many procedures. When we visited, there was an out reach programme running. There were specialists from around the country who had gone to Engela Hospital for 3 days. We went into the theatre suite and met surgeons from Rundu and Windhoek. It is the first programme of its kind to be held in Engela but is part of a much bigger outreach programme. Engela Hospital is very near the Angolan border. there is a campsite outside the hospital where Angolans stay, waiting to be admitted to the hospital to have their baby. It must be so hot inside the tents. When we were there, it was 40C.